1.) Preheat oven to 350 degrees. Cut a deep, 2-inch slit into the side of each chop and stuff with 1 oz of the cheese. Season the chops on both sides with salt, then coat them with the bread crumbs. 2.) In a large skillet, heat 1 tbsp oil over medium heat until hot but not smoking. Add the pork chops and cook until the bread crumbs are golden brown on both sides, about 3 to 4 minutes per side. 3.) While the pork cooks, prepare the asparagus: Place the washed spears on a large piece of aluminum foil, brush with the remaining 1/2 tbsp of oil, and season with salt to taste. Fold the foil around the spears to seal in a fairly tight package. Place the package on a cookie sheet in the oven and let cook for 15 to 20 minutes or until tender. 4.) 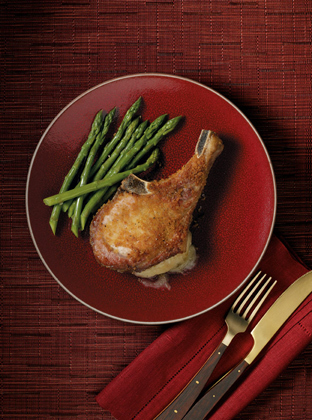 Transfer the chops to an oven-safe dish and finish cooking in the oven, about 10 minutes. Stuffed chops look fancy, but the dish is super easy—and very lean (just trim away any excess fat on the outside of the pork). Panko crumbs are coarsely ground, so they’ll stick directly to the meat, replacing the need for egg and flour in a traditional breading. And since you’re crisping the meat in canola oil instead of butter, the meal is even heart healthy.